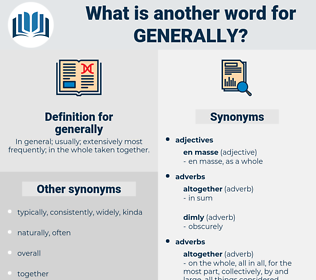 What is another word for generally? In general; usually; extensively most frequently; in the whole taken together. GS, general, mostly, mainly, overall. 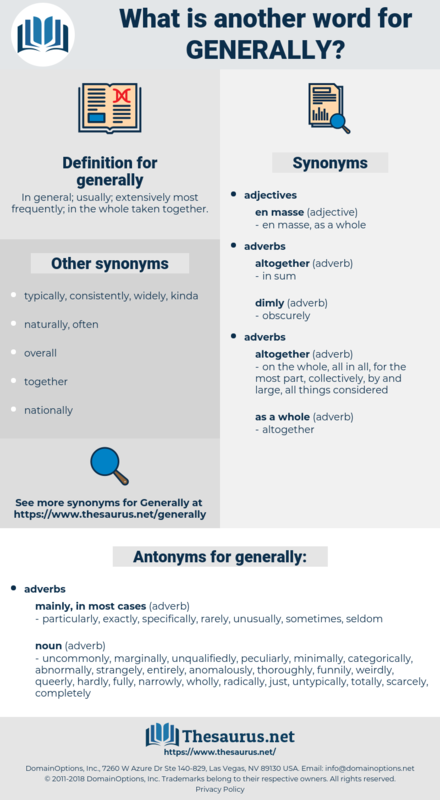 largely, universally, traditionally, often, globally, essentially, frequently, generically, basically, customarily, habitually, routinely, predominantly, roughly, altogether, comprehensively, popularly, regularly, primarily, principally, large, conventionally, substantially, extensively, relatively, fundamentally, consistently, collectively, always, rarely, invariably, fairly, overwhelmingly, virtually, historically, rather, likely, all, currently, together, publicly, mostly, significantly, characteristically, quite, reasonably, mainly, approximately, plenary, completely, however, holistically, well, chiefly, heavily, jointly, otherwise, almost, readily, internationally, most, totally, entirely, loosely, actually, practically, amply, probably, overall. particularly, exactly, specifically, rarely, unusually, sometimes, seldom. totally, peculiarly, queerly, narrowly, untypically, funnily, anomalously, thoroughly, fully, hardly, oddly, just, perfectly, atypically, categorically, marginally, abnormally, extraordinarily, radically, irregularly, minimally, scarcely, barely, entirely, absolutely, unqualifiedly, uncommonly, completely, strangely, wholly, weirdly.
" They generally are," said Jack laughing. It was not till the next morning that the news had become generally known.